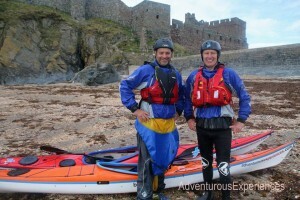 The Cockleshell Endeavour duo, Mick Dawson and Steve Grenham, have spent the past week training in the sea around the Isle of Man. 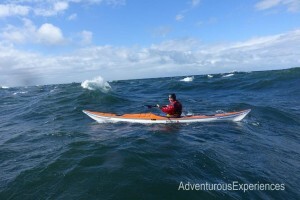 This is the first time the pair have experienced conditions similar to those facing them during their circumnavigation of the Falkland Islands in Spring 2016 and gave them a chance to try out the sea kayaks they will be using during their 650mile circumnavigation of the South Atlantic islands. Well, we’ve arrived, despite the M6’s best efforts….. Along with the wind and the rain looking at the forecast. Should be a great weeks training though. First day in the Isle of Man went well. 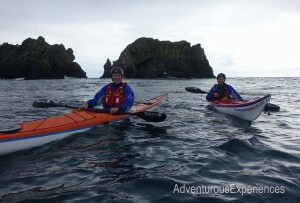 Weather forecast held off… A bit and we got a blinding days tuition in with Kieron the owner of Adventurous Activities who we’re training with for the first part of the week. Started to put some of the bad habits we’ve developed right and drilled us with some of the techniques we’re going to need down South (mainly getting back into the boats…). Only phot’ we managed today is this one at the end of the day after some self rescue exercises and a couple of hundred metre swim to shore with the kayaks…. (Not smiles on our faces, more relief :0) ). 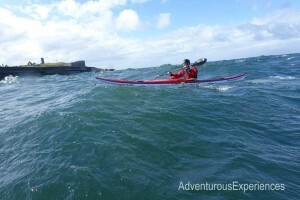 Great to be out on the sea again and looking forward to tomorrows adventures. Yesterday brought our first days rough weather training, along with some beach landing and departure drills in the surf. 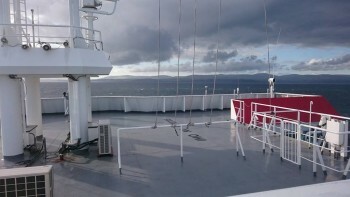 25 to 30 knot winds created ideal conditions but with a similar forecast for Thursday and Friday we won’t have a window to complete the circumnavigation of the island we’d hoped. Regardless of that though we have had four excellent, full on and increasingly challenging days training under the superb tuition of Kierron (Owner of Adventurous Experiences) and one of his lead instructors George. We’ll be continuing the training alone for the rest of the week putting into practice the catalogue of skills and drills we’ve been shown around the island. Great job guys and thanks. Two more tough days training and some great mileage along the coast. Although the circumnavigation wasn’t an option with the weather forecast this week we’ve still got a lot of hours and miles in the boats as well as cracking some great training. In the shelter of the East Coast today away from the North Westerly wind we put some miles in North of Douglas and then spent several hours practicing the self rescue techniques we’ll need to have in place for the Falklands trip. Lots of bruises to show for our efforts but we’re steadily getting there.